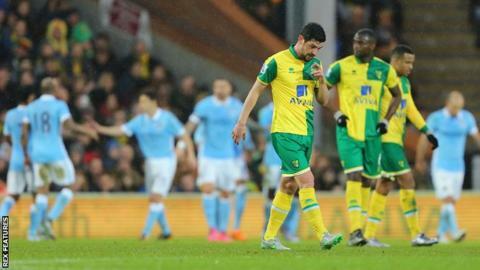 Norwich boss Alex Neil will give "no apologies" for making seven changes for the 3-0 FA Cup loss to Manchester City. Norwich, 15th in the Premier League, face Stoke and Bournemouth next. "Our main priority is to stay in the Premier League, that's the bottom line," Neil told BBC Radio Norfolk. "We've got two really crucial games coming up - we'll have a lot of guys who are fresh who've not been involved or played small parts that will be able to give their all in the next two." Goals from Sergio Aguero, Kelechi Iheanacho and Kevin de Bruyne gave Manchester City, who also made seven changes for the match, victory in the all-Premier League third-round tie. But Neil is more concerned by Wednesday's trip to 10th-placed Stoke and Saturday's visit to Bournemouth, just one place below them in the table, than dwelling on their FA Cup exit. "If I put my strongest team out and we lose against one of the best teams in the league, then we get to Wednesday and we lose that because we're fatigued, then we've got a huge game Saturday and they're still a bit fatigued with that, then you're just making yourself problems," the Scot said. "I make no apologies for changing the team up. I think it was the right decision, and I hope I'm justified in the next two games."